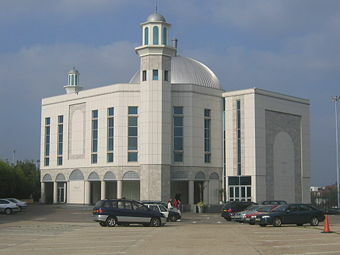 The Ahmadiyya Mosque in London, England. The term Ahmadi (Urdu: Ø§Ø­Ù…Ø¯ÛŒÛ Ahmadiyya) refers to the followers of a controversial religious movement that emerged in Qadian, a small village in East Punjab India, during the end of the nineteenth century. The movement was founded by Mirza Ghulam Ahmad (d. 1908), a Muslim who claimed to have fulfilled Christian and Islamic prophecies by being the second advent of Christ as well as the Imam Mahdi and Mujaddid (reformer of the age) of the fourteenth Islamic century. Ahmadis consider themselves Muslims, and Mirza Ghulam Ahmad termed the movement that he founded the Ahmadiyya Muslim Jamaat (community) envisioning it to be a revitalization of Islam. However, Ahmadis are not considered to be Muslims by Sunnis or Shias. Following Mirza Ghulam Ahmad's death, the original Ahmadiyya Muslim Jamaat split into two separate groups known respectively as the Ahmadiyya Muslim Community and the smaller Lahore Ahmadiyya Movement for the Propagation of Islam (Ahmadiyya Anjuman Ishaat-i-Islam). These groups vary in their specific interpretations of the founder's teachings and claims. They also differ in their views on whom should have succeeded Mirza Ghulam Ahmad, and how such a successor should be chosen. The Ahmadi version of Islam has been controversial to mainstream Muslims since its birth. Muslims have not accepted Mirza Ghulam Ahmad's claims and do not consider Ahmadis to be Muslims at all citing in particular the Ahmadiyya view on ascension and return of Jesus, the concept of Jihad, and the Ahmadiyya Muslim Community view on the finality of Muhammad with particular reference to interpretation of verse [Quran 33:40] of the Qur'an. Ahmadis, however, argue that their beliefs are in accordance with Islam, and using arguments from the Qur'an, Hadith and opinion of Islamic jurists, challenge the contention of the groups calling them non-Muslims. The Ahmadiyya movement claims to represent the latter day renaissance of the religion of Islam. At the end of the nineteenth century, Mirza Ghulam Ahmad of Qadian proclaimed himself to be the "Reformer of the age" (Mujaddid), (Promised Messiah, Mahdi of the age.) (Note that the two sub-sects of the Ahmadiyya interpret this last claim very differently). He claimed to have fulfilled the prophecy of the return of Jesus. He and his followers claimed that his advent was foretold by both Prophet Muhammad and many other religious scriptures of the world. In 1889, Mirza Ghulam Ahmad laid down the foundation of his community, which was later given the name of "Ahmadiyya Muslim Jamaat." Since its inception, the Ahmadiyya Muslim Jamaat's objective has been the revival of Islam. Soon after the death of the first successor, the movement split into two sects over the question of the Finality of Prophethood. The Lahore Ahmadiyya Movement affirmed the traditional Islamic interpretation that there could be no new prophet after Muhammad and viewed itself as a reform movement within the broader Ummah. The Ahmadiyya Muslim Community, however, claimed that Mirza Ghulam Ahmad had indeed been a prophet (albeit a "non-law-bearing" one) and that mainstream Muslims who rejected his message were guilty of disbelief. The question of "Khilafat" was also an issue in the split of the Ahmadiyya movement. The Lahore Ahmadiyya Movement believes that an "Anjuman" (body of selected people) should be in charge of the Jamaat. The Ahmadiyya Muslim Community, however, believes that Caliphs are appointed by God and they are in charge. Some of the first people to convert to the Ahmadiyya movement were highly educated people from secular and religious circles. These included many civil servants and also from the military, such as Ali Gouhar of the British-Indian Army. The Ahmadiyya Muslim Community has established offices in 190 countries and claims to have a population exceeding tens of millions. The Lahore Ahmadiyya Movement has branches in 17 countries. There is no reliable information available regarding the population numbers of the Lahore Ahmadiyya Movement. Overseas Ahmadiyya missionary activities started as early as 1920s. For many modern nations of the world, the Ahmadiyya movement was their first contact with the proclaimants from the Muslim world. Ahmadiyya movement is considered by some historians as one of the precursors to the African-American Civil Rights Movement in America. According to some experts, Ahmadiyya were "arguably the most influential community in African-American Islam" until the 1950s, when Nation of Islam gained support among black communities. Many notable Jazz musicians converted to Ahmadiyya Islam. The influence of Ahmadiyya movement was later reduced by the splits among the community caused by Nation of Islam as well as the Sunni scholars during the 1950s. In some countries it is a legal offence for the Ahmadiyya Movement to preach their religion as Islam. The Pakistani parliament has declared Ahmadis to be non-Muslims. In 1974, the government of Pakistan amended its constitution to define a Muslim "as a person who believes in the finality of the Prophet Muhammad". Due to this strong clash of beliefs, Ahmadis have been the target of many attacks led by various religious groups. As a result of the cultural implications of the laws and constitutional amendments regarding Ahmadis in Pakistan, persecution and hate-related incidents are constantly reported from different parts of the country. Religious seminaries and madrassahs in Pakistan, belonging to different sects of Islam have prescribed essential reading materials specifically targeted at refuting Ahmadiyya beliefs. In a recent survey in Pakistan, pupils in private schools of Pakistan expressed their opinions on religious tolerance in the country. The figures assembled in the study reflect that even in the educated classes of Pakistan, Ahmadis are considered to be the least deserving minority in terms of equal opportunities and civil rights. In the same study, the teachers in these elite schools showed even lower amount of tolerance towards Ahmadis than their pupils. Lahori Ahmadis claim that mainstream Muslim critics of Ahmadis often fail to note the important distinctions between the groups, treating all "Ahmadis" as members of the "Ahmadiyya Muslim Community." In Bangladesh, fundamentalist Islamic groups have demanded that Ahmadiyyas be declared officially as kafirs (infidels). Ahmadiyyas have become a persecuted group, targeted via protests and acts of violence. According to Amnesty International, followers have been subject to "house arrest," and several have been killed. In late 2003, several large marches, led by Moulana Moahmud Hossain Mumtazi, were directed to occupy an Ahmadi mosque. The march was supported by thousands of protesters, armed with sticks, bricks, and other weapons; they chanted slogans of hate-filled and violent rhetoric. In 2004, all Ahmadi publications were banned, the official reason being that they "hurt or might hurt the sentiments of the majority Muslim population". Ahmadiyya beliefs mostly mirror those of Islam in general, including belief in the prophethood of Muhammad, reverence for historical prophets, belief in a single creator God (strong monotheism). They accept the Qur'an as their holy text, face the Kaaba during prayer and accept the authority of hadiths (reported sayings of and stories about Muhammad). That the prophecies concerning the second coming of Jesus were metaphorical in nature and not literal. Mirza Ghulam Ahmad fulfilled these prophecies as the second advent of Jesus, the promised Mahdi, and the Messiah. That the Qur'an has no contradictions (or abrogations), and has precedence over the Hadith or traditions; i.e., that one verse of the Qur'an does not cancel another and that no Hadith can contradict a verse of the Qur'an. Hadith that appear to contradict the Qur'an are not accepted by Ahmadi Muslims. That Jesus, contrary to mainstream Islamic belief, was crucified and survived the four hours on the cross. He was later revived from a swoon in the tomb. Ahmadis believe that Jesus died in Kashmir of old age whilst seeking the Lost Tribes of Israel. Jesus' remains are believed to be entombed in Kashmir under the name Yuz Asaf. Ahmadis believe that Jesus foretold the coming of Muhammad after him, which Christians have misinterpreted. That Jihad can only be used to protect against extreme religious persecution, and that Muslims have used Jihad as a tool for political opportunism. That the "Messiah" and the "Imam Mahdi" are the same person, and that it is through his teachings, influence, his prayers and that of his followers that Islam will defeat the Anti-Christ or Dajjal in a period similar to the period of time it took for nascent Christianity to rise (300 years) and that the Dajjal's power will slowly melt away like the melting of snow, heralding the final victory of Islam and age of peace. That the history of humankind is split into seven epochs or ages, parallel to the seven days of the week, with periods for light and darkness and that Mirza Ghulam Ahmad appeared as the Promised Messiah at the sixth epoch heralding the seventh and final age of the world. A day in the estimation of God is like a thousand years of man's reckoning (Qur'an: 22:48). According to Ghulam Ahmad just as the sixth day of the week is reserved for Jumu'ah (congregational prayers) likewise his age is destined for a global gathering or assembly in which the world is to unite under one universal religion, which according to him, was Islam. The two Ahmadiyya groups have varying beliefs regarding the finality of the Prophethood of Muhammad. The Ahmadiyya Muslim Community believes that Muhammad brought prophethood to perfection and was the last law-bearing prophet and the apex of man's spiritual evolution. New prophets can come but they must be subordinate to Muhammad and cannot exceed him in excellence nor alter his teaching or bring any new law or religion. The Lahore Ahmadiyya Movement believes that Muhammad is the last of the prophets and no prophet, new or old, can come after him. Differs, but often considered an apostate. Many mainstream Muslims believe that Mirza Ghulam Ahmad was one of the 30 false claimants to prophethood about whom the prophet Muhammad warned Muslims 1400 years ago. Mujaddid (Islamic Reformer) of the 14th Islamic century. The promised Mahdi and the second coming of Jesus. Referred to as a prophet in the metaphorical sense only (as other recognized Islamic saints and Sufis are similarly called). Not a prophet in the technical and linguistic meaning of the word. A prophet (with all the qualities of a prophet like Jesus) but subordinate and deputy to the Prophet Muhammad. The Messiah, Imam Mehdi and Mujaddid of the 14th Islamic century and the second coming of Jesus. The Kalima Shahada is La illaha ilallah, muhammadur rasullulah. Professing the Kalima required to become a Muslim and in Pakistan, declaring Mirza Ghulam Ahmad to be an apostate is a prerequisite to be considered a Muslim. The Kalima Shahada is La illaha ilallah, muhammadur rasullulah. Anyone saying the Kalima Shahadat cannot be declared a non-Muslim by anyone else. The Kalima Shahada is La illaha ilallah, muhammadur rasullulah. Anyone saying the Kalima Shahadat cannot be declared a non-Muslim by anyone else. However, any one who does not believe in Mirza Ghluam Ahmad's claims is a non-Muslim. The meaning of â€œSeal of the Prophetsâ€ is that Muhammad is the last of the prophets. However this does not preclude the re-arrival of an old Prophet (Jesus) at the end of days. The meaning of â€œSeal of the Prophetsâ€ is that Muhammad is the last of the prophets. No prophet, either new or old can come after him. Mirza Ghulam Ahmad was the Mujaddid (reformer) of the 14th century Hijra and not a true prophet. Hazrat Muhammad brought prophethood to perfection, he sealed prophethood and religious law. New prophets can come after him provided they follow the example and message set by him in every respect. Prophet Muhammad was the last law-bearing prophet, new prophets can come but they must be subordinate to Hazrat Muhammad and cannot exceed him in excellence nor alter his teaching or bring any new law or religion. Born of a miraculous birth from the virgin, Mary. Did not die on the cross but was transported to heaven, where he lives to return in the flesh to this world shortly before Doomsday. Since Jesus (considered a prophet) came before Muhammad, his return to Earth would not disqualify Muhammad as the â€œlastâ€ prophet. Similar to Ahmadiyya Muslim Community belief except that the question of Jesus' virgin birth is not an essential requirement of faith and is left to the individual's personal conviction. Jesus was born to the Virgin Mary. He survived the crucifixion and did not die an accursed death. Instead he travelled east to India in search of the Lost Tribes of Israel. Jesus lived a full life and died on earth, specifically Jesus' tomb lies in Kashmir under the name Yuz Asaf. Some groups believe aggressive armed struggle to be the most valid interpretation of Jihad and consider it permissible and legal. According to a famous Hadith (a tradition of the Prophet Muhammed) there are two different types of Jihad: Jihad Al-Akbar, (considered the greater Jihad) is the personal struggle with one's own soul and Jihad Al-Asghar (considered the lesser Jihad) is the external, physical effort, often implying fighting. Jihad primarily means to strive or exert to the fullest. On an ongoing basis this refers to striving against the devil, ones low desires (self) and the peaceful propagation of Islam with special emphasis on spreading the true message of Islam by the pen. In special circumstances Jihad could be an armed struggle but only as a defensive war against extreme persecution. Claim that as per prophecy, the messiah rendered the concept of violent Jihad obsolete. They believe that the answer of hate should be given by love. As their khalifas said that 'if anyone attacks us we must not attack him and should love him' this is called "Jihaad-e-Akbar" (The Greater Jihad). Most orthodox Muslims consider both Ahmadi sects to be heretics for a number of reasons, chief among them being the question of finality of prophethood, since they believe members of the Ahmadiyya Muslim Community do not regard the Islamic prophet Muhammad to be the last prophet (the Lahore Ahmadiyya Movement does not subscribe to this belief). Ahmadis claim that this is a result of misinterpreting Mirza Ghulam Ahmad's statements referring to his coming "in the spirit of Muhammed", (similar to John the Baptist coming in the spirit and power of Elijah). Both Ahmadi sects believe Mirza Ghulam Ahmad to be the Mahdi and promised Messiah, while mainstream Muslims refute this claim, they do not believe that Mirza Ghulam Ahmad fulfilled the prophecies about the Promised Messiah and Mahdi and see him as a false prophet. Both Ahmadi groups are considered non-Muslims by the Pakistan government, and have this fact recorded on their travel documents. In contrast Ahmadi citizens from Western countries and other moderate Muslim nations perform Hajj and Umra as the Saudi government is not made aware they are Ahmadis when applying for the visa. A court decision has also upheld the right of Ahmadiyyas to identify themselves as Muslims in India. As the Lahore Ahmadiyya Movementâ€™s view regarding Mirza Ghulam Ahmadâ€™s status as a Prophet is closer to traditional Islamic thought, the Literature published by the Lahore Ahmadiyya Movement has found greater acceptability among the Muslim Intelligentsia. Some mainstream Muslims group both Ahmadi sects together and refer to them as "Qadianis," and their beliefs as "Qadianism" (after the small town of Qadian in the Gurdaspur District of Punjab in India, where the movement's founder was born). However, most, if not all, Ahmadis of both sects dislike this term as it has acquired derogatory connotations over the years and furthermore they prefer to differentiate their two separate movements. Mainstream Muslims will not use the term "Muslim" when referring to Ahmadis, even though both sects refer to themselves as such citing the fatwas given by the Islamic scholars. However, as members of Lahore Ahmadiyya Movement deny the prophethood of Mirza Ghulam Ahmad, some orthodox Islamic Scholars consider the Lahore Ahmadiyya as Muslims. In earlier times in Pakistan and India, there was widespread persecution of Ahmadis by certain Muslim groups. Sporadic violence as well as persecution of a more subtle nature against Ahmadis continues even today. "At their most extreme religious strategies for dealing with the Christian presence might involve attacking Christian revelation at its heart, as did the Punjabi Muslim, Ghulam Ahmad (d.1908), who founded the Ahmadiyya missionary sect." The primary significance of the Ahmadiyya Movement lay in its missionary emphasis. Every Muslim believed that Islam was the only religion free from error. The Ahmadiyas made it part of their principles to show the errors of other religions to their adherents and to proselytize energetically for Islam. In a sense, the Ahmadiyas represent the Muslims emerging, religiously speaking, from the withdrawal that had begun with the arrival of the British, just as the Muslim League represents the political emergence from that same withdrawal. ... It is somewhat ironic that the sect most attacked by Muslims in India and Pakistan has also been that, which has worked hardest, in both its branches, to defend and extend Islam against the competition offered by other faiths." The Ahmadiyya Movement considers Christian nations (particularly of the developed world) to be the prophesised Dajjal and Gog and Magog, thus making the relationship very hostile. The Ahmadiyya view of the death of Jesus has also been a source of ongoing friction with the Christian Church. Nevertheless, Ahmadi communities in different parts of the world have been promoting interfaith dialogue with other religious groups in an effort to propagate their ideas and to gain greater exposure to their religious viewpoints. 1914 Movement splits into two branches: one remains in Qadian, known today as Ahmadiyya Movement in Islam (Jamaat-i Ahmadiyya), and one is established in Lahore, known as the Lahore Ahmadiyya Movement for the Propagation of Islam (Ahmadiyya Anjuman Ishaat-i-Islam). 27 May 1908 - 13 March 1914 Maulana Hakeem Noor-ud-Din (b. 1841 - d. 1914), the first Caliph, after whose death the movement split. ↑ Maulana Muhammad Ali. "The Fourteenth-Century's Reformer / Mujaddid," from the "Call of Islam", Retrieved June 25, 2008. ↑ Mohammad Bashir, 1974 Declaration by World Muslim League. World Muslim League, April 1974. Retrieved June 25, 2008. ↑ A Study of the Fatwa by Rashid Rida on the Translation of the Qur'an Retrieved June 25, 2008. ↑ Pakistani Constitutional Amendments of 1974 Declaring Qadianis as a non-Muslim Minority alhafeez.org. Retrieved June 25, 2008. ↑ "The Split in the Ahmadiyya Movement" by Maulana Muhammad Ali Retrieved June 25, 2008. ↑ "Refutation of Maulvi Muhammad Ali's Account of Ahmadiyya Dissensions" Retrieved June 25, 2008. ↑ "Pseudo-Islamic Cults-The Ahmadiyya/Qadiani Movement", thetruereligion.org. Retrieved June 25, 2008. ↑ Accusations Answered AAIIL. Retrieved June 25, 2008. ↑ Misconceptions about Ahmadiyyat AAIIL Website. Retrieved June 25, 2008. ↑ Fatwas of Kufr AAIIL. Retrieved June 25, 2008. ↑ "Ahmadiyya," Encyclopaedia Britannica Online, Retrieved June 25, 2008. ↑ "The British Archives Retrieved June 25, 2008. ↑ "The Ahmadiyya Movement in Islam An Overview," Al Islam, The official website of the Ahmadiyya Muslims Community. Retrieved June 25, 2008. ↑ World Wide Branches of AAIIL Lahore Ahmadiyya Movement. Retrieved June 25, 2008. ↑ The Multiple Nature Of The Islamic Da'wa, Egdunas Racius, 158-160. University of Helsinki. Retrieved June 25, 2008. ↑ Michael Angelo Gomez. Black Crescent: the experience and legacy of African Muslims in the Americas, 254-256. books.google. Retrieved June 25, 2008. ↑ Timothy Miller. America's Alternative Religions, 280.books.google. Retrieved June 25, 2008. ↑ Timothy Miller. America's Alternative Religions, 280. Retrieved June 25, 2008. ↑ An Act to amend the Constitution (2nd Amendment) ACT, 1974. An Act to amend the Constitution of the Islamic Republic of Pakistan Gazette of Pakistan, Extraordinary, Part I, September 21, 1974. Retrieved June 25, 2008. ↑ Amjad Mahmood Khan, Persecution of the Ahmadiyya Community in Pakistan: An Analysis Under International Law and International Relations Harvard Human Rights Journal 16 (September 2003). Retrieved June 25, 2008. "Violent Dhaka rally against sect", BBC News "Eight die in Pakistan sect attack", BBC News October 7, 2005. "Sect offices closed in Pakistan", BBC News. Retrieved June 25, 2008. ↑ Tariq Rahman, Denizens of Alien Worlds: A Survey of the Education System of Pakistan.. Contemporary South Asia, 2004 15. Retrieved June 25, 2008. ↑ Peace and Democracy in South Asia, Volume 1, Number 1, January 2005. Passports to Privilege: The English-Medium Schools In Pakistan, Tariq Rahman Retrieved June 25, 2008. ↑ Bangladesh: The Ahmediyya Community - their rights must be protected, Amnesty International. Retrieved June 25, 2008. ↑ Maulana Muhammad Ali. Mahdi and Messiah, Chapter 4, "The Founder of the Ahmadiyya Movement..ahmaniyya.org. Retrieved June 25, 2008. ↑ Maulana Muhammad Ali, Abrogation "The Matter of Abrogation," Friday Sermon December 20 1914.AAIIL.org. Retrieved June 25, 2008. ↑ Jesus, a Humble Prophet of God alislam.org. Retrieved June 25, 2008. ↑ Shahid Aziz, Death of Jesus,". Bulletin, October 2001, Ahmadiyya Anjuman Ishaat Islam Lahore (UK) Retrieved June 25, 2008. Dr. Aziz Ahmad Chaudhry, "Jesus Migrated to India,". The Promised Mehdi and Messiah. (Islam International Publications Limited) Retrieved June 25, 2008. ↑ Maulana Abdul Haq Vidyarthi, Muhammad in World Scriptures (Vol. 2). Advent of Holy Prophet Muhammad Foretold in the Books of the Old Testament of Jews and the New Testament of Christians.'aaiil.org. Retrieved June 25, 2008. "True Meaning of Jihad," Compiled by Imam Kalamazad Mohammed; Published by the Muslim Literary Trust, Trinidad, Retrieved June 25, 2008. ↑ Dr. Aziz Ahmad Chaudhry, "The Question of Finality of Prophethood," The Promised Mehdi and Messiha. (Islam International Publications Limited),  Retrieved June 25, 2008. ↑ Lahore Ahmadiyya Movement, "The Issue of Khatam-un-Nabiyyin" Retrieved June 25, 2008. ↑ "Hazrat Mirza Ghulam Ahmad Sahib of Qadian never Claimed Prophethood [in the light of his own writings]," The Lahore Ahmadiyya Movement,  Retrieved June 25, 2008. ↑ "A Prophet Like Unto Moses," The Promised Mehdi and Messiah by Dr. Aziz Ahmad Chaudhry, Islam International Publications Limited,  Retrieved June 25, 2008. ↑ An Act to amend the Constitution (2nd Amendment) ACT, 1974. An Act to amend the Constitution of the Islamic Republic of Pakistan Gazette of Pakistan, Extraordinary, Part I, 21st September, 1974 Retrieved June 25, 2008. "Tarjuman al-Quran" by Sayyid Abul Ala Maudoodi, issue for month of Jumadi al-Awwal, 1355 A.H., circa 1936, vol. viii, p. 5. Retrieved June 25, 2008. ↑ "Five Pillars of Islam,"  Islam101.com. ↑ Dr. Aziz Ahmad Chaudhry, "The Question of Finality of Prophethood," The Promised Messiha and Mehdi. Islam International Publications Limited, alislam.org. ↑ 56.0 56.1 azrat Mirza Ghulam Ahmad Sahib of Qadian never Claimed Prophethood (in the light of his own writings). The Lahore Ahmadiyya Movement. ↑ Chaudhry, Aziz Ahmad. The Question of Finality of Prophethood, The Promised Messiha and Mehdi. Islam International Publications Limited. ↑ Abbott Freeland. Islam and Pakistan. (Ithaca: Cornell University, 1968. ISBN 9780801400032), 160-161. Robinson, Francis. "The British Empire and the Muslim world." 398-420. In: The Oxford History of the British Empire. Oxford University Press, Oxford, 2001. ISBN 0199246793. This page was last modified on 9 February 2019, at 17:02.